I’ve been busy filling orders and visiting doctors. I’ve also been taking lots of pix to be shared in the near future! I promise I will get caught up right soon. Today I wanted to share with ya’ll the inspiration I ran across via my email following. I love Angel at Fleece Fun.com! She focuses usually on making all kinds of fleecy fun wearables, toys, you name it! Today, however, she was sharing her take on some Rice Krispie Treats! These are always a big hit with my family. Indeed my son in law would take an entire pan of RKTreats just for himself! 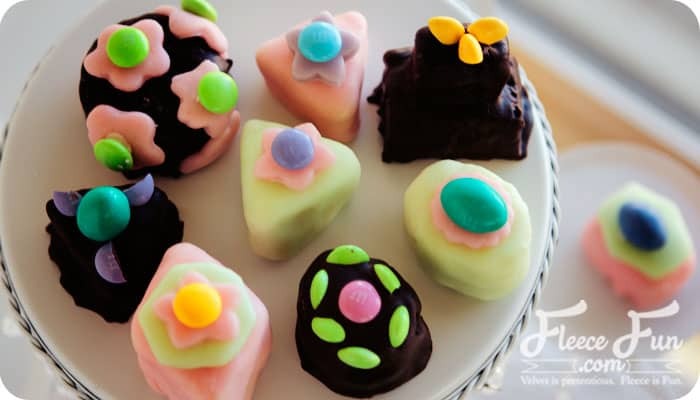 Aren’t these petit fours just darling? I know I heard my belly growl When I first saw them. I got so excited! I have been thinking to make up Krispie Treats to take for my family’s Easter gathering come Sunday. I wasn’t asked to bring anything but hey, it’s Easter and I still love my kids, their hubbies, and my beautiful grand daughter. Aren’t Nana’s supposed to treat their children well? MY Gramma was always trying to fatten us up when I was little. I loved that about her. I read through Angel’s post and see where she used store bought Krispie Treats to save on time. That’s a good idea. I will probably make my own and throw another twist to the mix. I like making them with a mix of Rice Krispies and Fruity Pebbles! That makes them colorfully fruity. I am also thinking to perhaps make some with Kix or with the new Reece’s Pieces cereal. What kind of cereal would you use for variety? Another thing I discovered when reading through Angel’s bog is how EASY it can be to make simple fondant! I honestly never knew it could be so easy! Using the microwave is a bonus for me since I seldom ever actually use my stove. Many times in the past when I stuffed plastic eggs and filled baskets I would still have candies left over. Great reason to use some of them for decorating these! I can also see making these around Halloween and using little pumpkin candies to decorate them. Wouldn’t that be cute? Or how about with edible flowers for Mother’s Day? Be sure to look up what kinds are edible! Don’t just start throwing flowers on just because they are pretty! Good Heavens I would be heartsick if I ever heard somebody took my idea and ended up horribly sick! Do your research first! Especially if you decide to make these for a fancy occasion like a wedding! And oh the ideas for making these come Christmas time! Or fill a Valentine’s Box? The ideas just keep on coming! Can you tell how truly inspired I am with her blog post this round? I love tea parties and seldom ever get to enjoy any. Looking forward to when my granddaughter is a bit older than her terrible two’s. She’s just about there now. We are going to have some epic tea parties! Complete with Nana’s Rice Krispie Treat tea cakes! So happy you enjoyed the post – I like your fruity pebbles idea. It wuold be a great way to add color. Hope you have a wonderful Easter!